What an odd title. Deconstructed and Reconstructed Rhubarb and Fruit Crumble. A bit poncey sounding. It may conjure up a Meccano set of Heston Blumenthal wizardry to some. Or little dollops of fruit, crumble and custard artfully triangulated on a plate to others. It is neither. It is just my way of making crumble suitable for now and later eating. You see, I make up the fruit bit separate to the crumble and marry them just before eating. No soggy crumble, and everyone gets as much – or as little(!) – crumble as they like.You know how tricky it is to be fair when divvying up any dessert? A crumble is a ruddy nightmare. 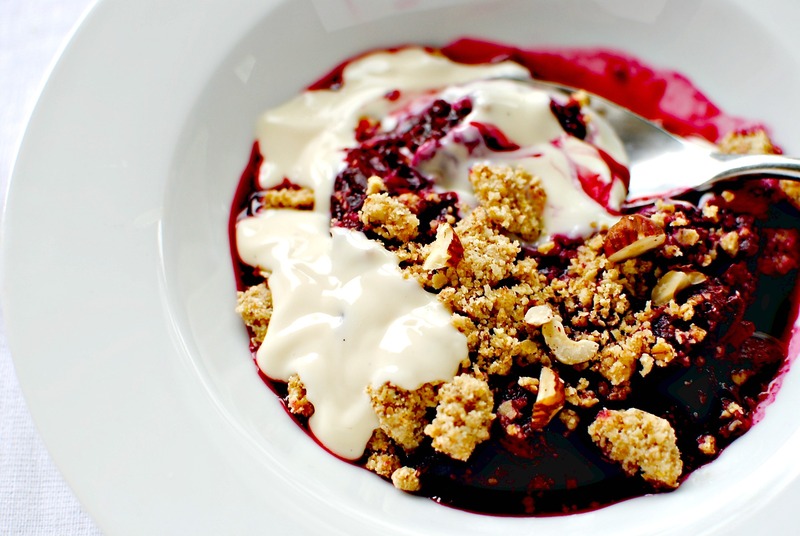 Most everyone wants an equal wodge of nubbly, buttery crumble to sticky, jammy fruit. Just not possible with a traditionally made crumble. My method sorts this minor problem with ease and fairness. The only thing more fair would be to let everyone actually help themselves. But that of course risks all kinds of problems, including that the cook will not at the end get the perk of licking the spoon and scraping the jammy sides. We would not let that happen at food to glow. The other advantage – and the reason why I actually do this (fairness, schmairness) – is that I can make this up the day before one of my nutrition classes with minimal fuss on the day itself. In truth you can do this with probably any fruit crumble recipe. Some of you who read this might want to substitute the raw sugar for honey, maple syrup or even date syrup. I find that for the texture I want the raw sugar is a good thing in the crumble. But any of you who don’t want any added sugar-sugar, do whizz up some dates and use that to sweeten. The fruit is a bit more of a free for all with regards to sweetness. Use what you like to sweeten, but try and do so minimally to not only preserve the essential tart-sweetness of this crumble, but to keep it on the healthier side of pudding heaven. forced rhubarb here, but you get the idea. Look at those slender stems! Outdoor-grown rhubarb is just coming in season – long, thick, pinky-green stalks of delicious mouth-puckering tartness. It is perfect for a crumble, and makes possibly the most British of crumbles. I find that although forced rhubarb is more tender, the hardy outdoor varieties have a finer taste, belying their huskier-by-comparison appearance. Like blood oranges, I will pounce on new rhubarb like a cat will a waggled string, grabbing it up as quickly as I can before it gets limp in the heat. First from Nigel Slater writing in The Observer – recipes for both panna cotta and lamb. 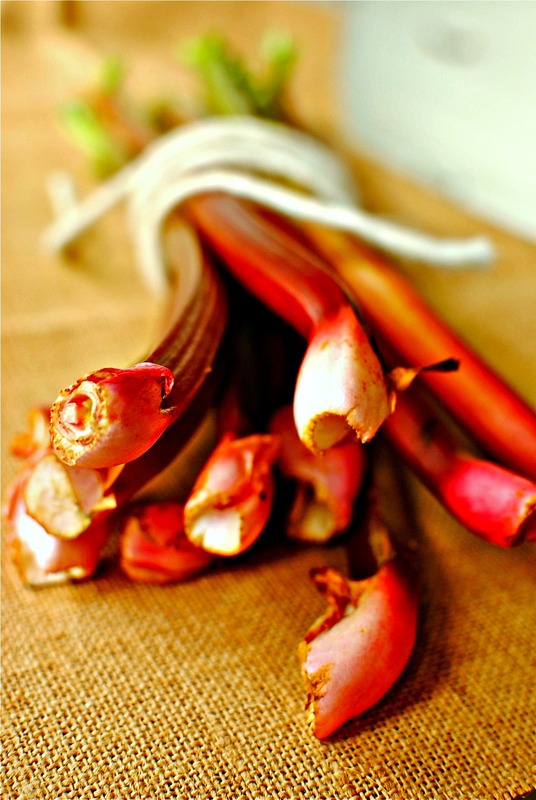 Do you have any rhubarb recipes you wish to share? If so, please leave a link in your comment as I would love to see more healthy recipes for this little-used vegetable. It is the start of rhubarb season, so of course one has to make a rhubarb crumble at least once. It’s a law, I’m sure. 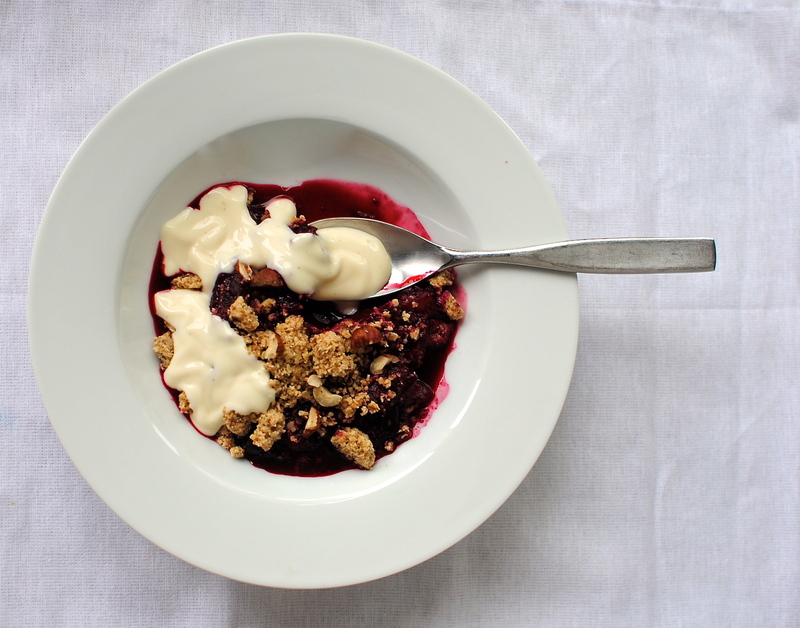 But I wanted to amp up the nutrients, colour and flavour of my crumble with the addition of blackcurrants and apples. These two are also great for turning rather sloppy rhubarb into a gooey spoon of yum. It’s the pectin you see. But use all rhubarb, or apple and rhubarb, or even apple, strawberry and rhubarb for a deluxe and easy spring treat. I used blackcurrants frozen the day they were picked last summer, but do use the frozen ones from the supermarket. As for the sweetness, that’s up to you. I have erred on the side of tart but add more as you wish. Also, although I have cooked the crumble topping and fruit separately, you can do as you would for a ‘normal’ crumble by popping the raw topping onto raw fruit and baking for 40 minutes at 180C/160C fan/350F. I like to do it separately for my nutrition groups so that I can just pull it together in the morning and reheat the whole thing for 10 minutes during the class. 1. First of all make the crumble by popping the chilled butter, sugar, flour cardamom and salt in a food processor. Pulse until the mixture resembles very coarse sand. Add the oats and pulse just to mix. You want to keep the texture. We are using the nuts later, so don’t add them now. 2. Pop the crumble mixture on a parchment paper-lined baking tray and bake in an 180C/160fan/350F oven for 15 minutes. The crumble should be a light brown. Pull the tray from the oven and let it cool, then tumble onto a plate or in an airtight container. 3. For the fruit, I like to roast the rhubarb separately (see the images) as it pulls the moisture out and makes for a less sloppy crumble. But you can break down all of the components on the hob if you wish. OR indeed, the ‘normal way’ under the crumble itself. 4. If roasting the rhubarb, pop this on a lined baking tray, sprinkle over half of the sugar and pop in the oven for 15 minutes at the same time as the crumble. Set aside. 5. Ignoring the blueberries for now, add the chopped apple, the blackcurrants and remaining sugar to a medium saucepan and gently heat until the blackcurrants are just starting to break down and the apples soften – about five minutes. There should be no need to add water, but if it begins to stick then add a touch of water. Taste for sweetness and adjust accordingly. We keep it tart and serve with custard to add contrasting sweetness. 6. Now you can just add the roasted rhubarb to the pot and give a stir before serving with a handful of fresh blueberries on top, a sprinkling of crumble and a flurry of chopped nuts. 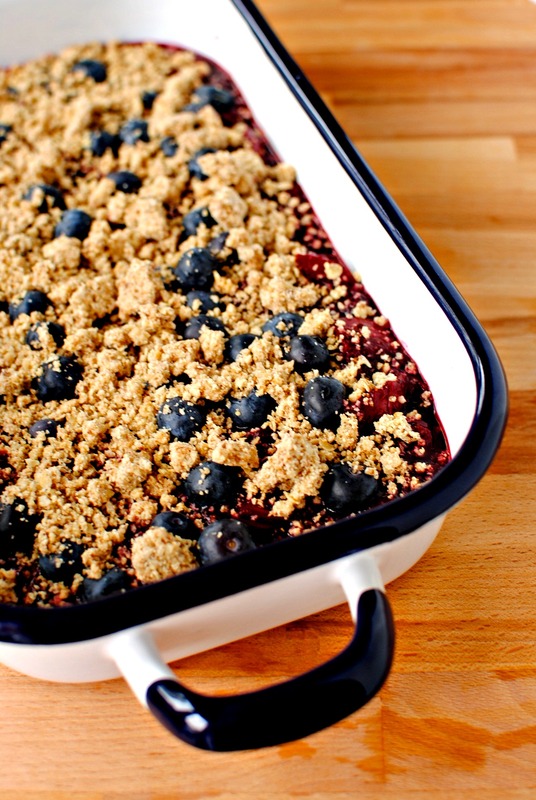 Or you may store them separately in the refrigerator and, when required, pop the cooked fruit and raw blueberries into an oven dish and top with the crumble to bake for 10-15 minutes at 180C/350F. Serve with cold or warm custard, cream, or any vegan equivalent (here’s a link to a post from Pure and Simple Bakes reviewing numerous vegan custard recipes). Makes a stunning breakfast too. Tip: I like to make triple quantities of the crumble mixture and store it in the freezer. This works whether it is cooked or raw. This week – after a break from doing such things for awhile (to give them a rest from me!) – I am popping this over to a few recipe round-ups. First over to the lovely Ren, who when her round-up is posted will have had baby number 3! She hosts Simple And In Season at her very stylish, eponymous blog. This post is whizzing over to the US to join up with Mark of the Javelin Warrior’ Cookin W/ Luv blog for his always fabulous and drool-worthy Made with Love Mondays. And finally back on this side of the Pond for Four Season’s Food, hosted by Eat Your Veg and Delicieux. Yummy! That is a good idea to make the topping separate. I love rhubarb, there is an ice cream shop here called Salt and Straw, right now one of their flavors is a rhubarb crumble with anise. So good, but I think their salted carmel or olive oil flavor would go redly well with an actual rhubarb crumble. Make mine olive oil! Wow, that sounds amazing. And love the name of the shop! Oooh I could dive right into this right now. We are big crumble fans here….now, you know I am one of your biggest ever fans….but…..I’m going to have to make this to check it out because, ok, I may be showing my Scottish roots but I have to admit I do love a little bit of stodge in my crumble. You know that bit that goes a teensy bit soggy….is that weird? So I’m worried I’m not going to love this as much as usual! Shock horror, I cant believe I said that! Well, the verdict is out and I shall report back – I bets its magnificent I will will have to eat my words….. I totally get that but for my workshops I need to sort things ahead and if I did it all in a one-r it would be like serving leftovers really. Not bad for just us but I really want to maximise the nutrition with minimal cooking if possible. Mr A will be with you in the stodge camp, so to speak! yes, of course, I see that’s a really great way of doing the crumble for the workshops too – I hadn’t thought of that. You factor in so many different things to your recipes, and it does look divine. I could so do with a bowl of it now! I am sending one virtually right now. Perfect for this rainy evening. PS Thanks for the ‘drop off’ Miss R won’t be home for a wee bit but I will make sure she sees it. Thanks for thinking of her. You are a good friend to her as well as me! Drool! Love that you included gluten and vegan options. Or, Fran, you could make a sneaky one for yourself – a mini version – and pop the extra crumble in the freezer. I won’t tell 😉 Poor Steve. He doesn’t know what he is missing, but that sounds a pretty fierce hatred! Very unique and sounds awesome! I have to try it and add it to my moms rhubarb recipes. I take it ant in season berry can be used? I am drooling! I think worthy of the slight ‘poncey’ name, looks beautiful. I love the word ‘triangulated’, I have made 2 Heston recipes and both were extremely tedious. Having been desperate to make the most of rhubarb at this time of year, this recipe looks perfect and good idea adding crumble at the end (no one likes soggy crumble). Thanks. I am so going to make this. It has every element I love in it. Sweet, sour, crumble. What more can you want? I know. I get bored with desserts that are just ‘one-note’ Gotta have that hint (or more) of something bitter, sour or somehow edgy, such as using cardamom or turmeric. Thanks for your kind comment. This is such a great dessert for spring and summer! Love it! Gorgeous! I love the blueberries of the constructed crumble. Never thought of that before but it totally goes! This is a great idea, Kellie! I married into a family of people who can’t be trusted around a crumble topping, always scraping off extra bits for themselves and acting all innocent when the topping has disappeared. Making them separate solves all kinds of problems. Genius! Big smile as I’m reading your comment, Katie 😉 I can only think that this is the case for ANY family and a dish of crumble! This looks and sounds divine Kellie….I love rhubarb and as you say it’s throwing its tasty tender stems into the light of my garden as I write. I LOVE rhubarb! Looks delicious! Great idea to avert the soggy crumble issue, which can really catch you out! 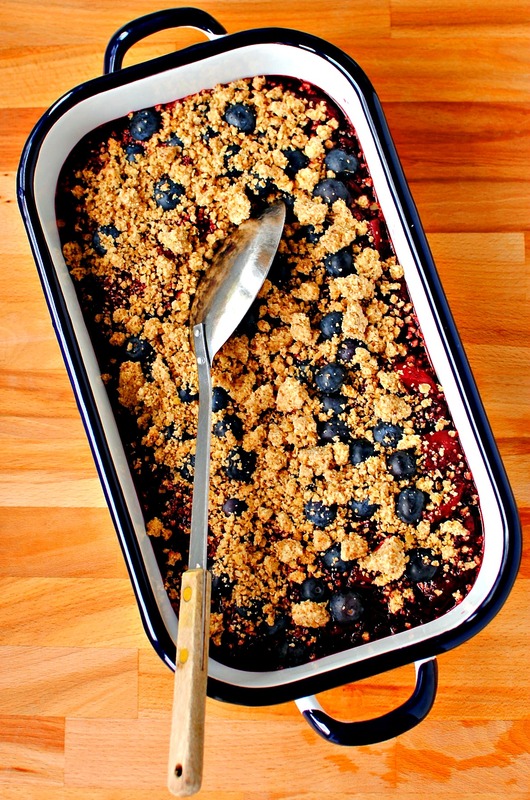 Lovely recipe for the crumble mix, love the additions of nuts and blueberries. Just pass the jug of custard please…..
MMMMMM,…delectable , served with hot pouring vegan custard,…ooh yes!